If you got to work by bus today, you can thank, or blame, Stanislaus Baudry. Baudry lived in the town of Nantes in France at a time when you either had your own carriage, hired a cab to get you from one specific place to another, or walked. The industrial age was really kicking off, which meant large groups of people had to move in roughly the same direction at roughly the same time. It occurred to Baudry, in 1823, that they might be happy to spend less money than they would on a cab, and less energy than they would on a walk. Baudry built an elongated carriage, got a few every strong horses to pull it, and had it travel a fixed route a few times a day. People could get off and on at various times. He called his original carriages “dames blanches,” but people objected to the name because it seemed pretentious and silly, so he switched to “voiture omnibus.” Baudry expanded from Nantes to Bordeaux, and from Bordeaux to Paris. 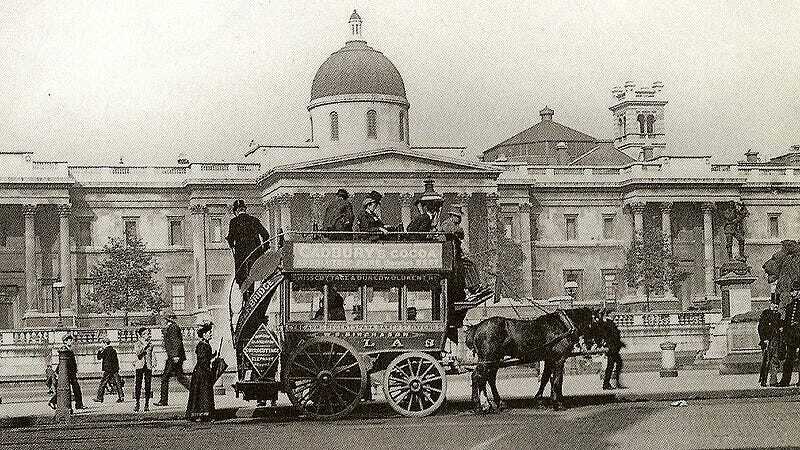 From there omnibus went global, with horse buses appearing in New York and in the UK by 1828. While American horse buses seemed to be popular, for a while the industry in England struggled. Cab drivers were not pleased by the competition and lobbied to enact laws that decreed that bus passengers could only step onto the bus at its starting point or its final destination. Their efforts were in vain, and buses caught on. Today, sadly, we make do with horseless omnibuses.